The middle of the 20th century, after World War II, saw many regional conflicts resulting from the Cold War between freedom in the United States and communism in the Soviet Union. Eventually freedom prevailed, but there is much history to be learned about how it prevailed. Also, there were many independence movements in the 20th century. Americans feared a “domino effect” of communism for good reason. Imagine a row of dominoes, and what happens when one falls into another, then into another, and so on. Each falling domino can knock over the one next to it. Americans starting with President Dwight Eisenhower feared that effect when communism took over a nation: all nearby nations could be the next to fall to that same communism. Southeast Asia has a large population, and after World War II the region was vulnerable to a spread of communism from the Soviet Union and China. An independence movement beginning in the 1930s caused the French to leave, and Vietnam’s Ho Chi Minh was a nationalist leader who received aid from the communists. The French imposed a death sentence on Ho Chi Minh; however, he fled to avoid this punishment. When he returned in 1941, he founded “Vietminh”, with the name reflecting that he intended to rule as a dictator. Japan interrupted his plan by taking control of the region during World War II, but in 1945 the Vietminh defeated the Japanese. That demonstrated how tough the Vietnamese fighters were, because the Japanese were invincible against China and many other opponents. Ho Chi Minh then declared the independence of a new Democratic Republic of Vietnam, a huge communist country that has 84 million people today. The French tried unsuccessfully to regain control of Vietnam after World War II. In 1954, the communist Vietnamese nationalists defeated the French at Dien Bien Phu and the French surrendered to Ho Chi Minh. The French then agreed to divide Vietnam at the 17th parallel, as part of the Geneva Conference. North Vietnam would be communist under Ho Chi Minh, while South Vietnam would be free under Ngo Dinh Diem. Ho Chi Minh was popular in both North and South Vietnam, and gave away land to the people in order to boost his popularity. Ngo Dinh Diem was unpopular, and the United States feared that an election in the South might choose Ho Chi Minh’s communists. So elections were postponed, but the conditions worsened. The Vietcong, who were communist guerrillas in the South, formed and began causing problems in the early 1960s. In 1963, South Vietnamese generals who had received support from the United States took over South Vietnam, and the generals shockingly assassinated Ngo Dinh Diem. The United States began sending military advisers and weapons to prevent a takeover of the South by the Vietcong. In August 1964, when President Lyndon Johnson faced reelection, there were mysterious gunshots fired at an American ship in the Gulf of Tonkin near North Vietnam. It was later disputed whether this was an actual attack on Americans. Johnson, wanting a war to boost his popularity and reelection chances, pushed the Gulf of Tonkin Resolution through Congress to authorize sending troops. A formal declaration of war never occurred, but this Resolution served as a substitute. Within a year, thousands of American 19-year-olds were sent to fight the communists in Vietnam. The Soviet Union, China and North Vietnam responded by sending their own troops and weapons to help the Vietcong. The United States bombed North Vietnam, and also bombed targets in South Vietnam to hit Vietcong hideouts. But the Vietcong were hard to find, and knew the jungle much better than the Americans did. The Vietcong planted land mines throughout the country, causing thousands of American soldiers to die or lose their limbs merely by taking a tragically wrong step. The conflict in Vietnam helped President Johnson win reelection in 1964, but by 1968 Americans (particularly Democrats in Johnson's own political party) had tired of the tens of thousands of American deaths. President Johnson did embarrassingly poorly in the first presidential primary (New Hampsire), and had to withdraw from the race for reelection. As with many wars, including the war in Iraq from 2003 to the present, public support for the war starts very high but tends to decline over time. When President Nixon arrived at the White House after the 1968 elections, he embraced “Vietnamization” as a policy for slowly withdrawing American troops from South Vietnam, hoping that the South Vietnamese would do more themselves in fighting communism. Nixon also increased bombing of North Vietnam and Vietcong strongholds in Cambodia and Laos. Nixon was heavily influenced by his adviser Henry Kissinger. Kissinger’s approach towards Vietnam was to launch bombing attacks and then look like a hero in declaring cease-fires. He did this repeatedly and received much praise by newspapers for it. But the communists would simply re-supply their guerrilla fighters during the cease-fires, and so the cease-fires actually helped the communists continue the war. (A "guerrilla" is someone who fights aggressively in an unorganized, irregular manner using surprise, deception and sabotage.) By 1973, the United States gave up and pulled the last American soldiers out. A million Vietnamese then fled South Vietnam to escape the communists, who took over by 1975. The United States imposed a trade embargo on the newly unified Vietnam that lasted until 1994. President Bush visited Vietnam in 2006. Things worsened further in next-door Cambodia after the Americans left Vietnam. Pol Pot took over Cambodia in 1975, and he abolished private property, money and religion, and converted everything back to an agricultural society. He emptied the cities. His ruthless policies possibly resulted in the death of 1-2 million Cambodians in the late 1970s. The Hollywood movie about his dictatorship, The Killing Fields, exposed his atrocities and perhaps exaggerated them as a way of blaming the United States, which once supported Pol Pot as a counterweight to Vietnam. Pol Pot’s Khmer Rouge government fell in 1979 when Vietnam invaded Cambodia after a series of violent border confrontations, and Pol Pot fled to the northern jungle with his forces. He died from illness in 1998. Today there are United Nations peacekeeping forces in Cambodia. In connection with the “Third World” of Latin America, Africa, and many parts of Asia, the Cold War became a battle for influence over the system of government adopted by any and every small country. It seemed like there were only two choices: communist or free (capitalist). Both the United States and Soviet Union would compete with each other to provide to developing nations aid, military advisers, social workers (e.g., the Peace Corps from the United States), educational programs and technology. This drama has been playing out in Latin America ever since World War II, and remains an issue even now. In the 1950s, the United States supported Fulgencio Batista as dictator of Cuba, but Fidel Castro overthrew him in 1959. Liberals in the United States promoted Castro as a hero, and he was welcomed to talk at American colleges. But just as conservatives predicted, Castro became a ruthless communist dictator who brutally suppressed all opposition and ended free speech and free enterprise on the island of Cuba. Castro seized private industries, such as the thriving sugar refineries, and predictably the Cuban economy collapsed. Cuba fell from being one of the most prosperous nations to one of the poorest. Today most Cubans cannot even afford to own an automobile. The United States imposed a trade embargo on Cuba and the Soviet Union provided it with aid, which was a typical pattern in this Cold War between the two superpowers. Cubans who had fled to Florida from the island arranged for an invasion of Cuba in April 1961 to overthrow Castro. President John F. Kennedy withheld support at the last minute and someone in his Administration probably leaked the plans to Castro, who was then waiting for it and slaughtered the invaders at the Bay of Pigs. President Kennedy allowed the United States to be humiliated by this. Strengthened, Castro became more aggressive and in 1962 began to install Soviet missiles to point them directly at the United States. President Kennedy ordered a blockade of Cuba to prevent installation of additional missiles, and a top American general put his bombers into combat mode. This demonstrated a readiness to go to war (“brinkmanship”) and the Soviet leader Khrushchev then backed down. Khrushchev agreed to remove the missiles when the United States agreed not to invade Cuba. But Cuba continued to grow closer politically to the Soviet Union, which funded its failing economy. In the 1970s Cuba sent 50,000 soldiers to help communism in Angola, and Cuba remained there until 1988. When communism itself fell in the Soviet Union in 1991 and it broke up, Cuba lost its funding. It became even poorer, dropping to desperate levels of poverty throughout the nation. Communism in Latin America was not limited to Cuba. In Nicaragua, communist rebels named the Sandinistas overthrew an American-backed ruler named Anastasio Somoza. The United States then supported the anti-communist Contras in the 1980s. In 1990, the Sandinista leader Daniel Ortega finally agreed to hold free elections in order to end the civil war, and he was defeated by the pro-American Violeta Chamorro. But in 1997 Arnoldo Alemán was elected as the Nicaraguan leader. Although supposedly not a communist, he formed a pact with the Sandinistas against his own Liberal Constitutionalist Party, and near the end of 2006 Daniel Ortega completed a successful comeback by being elected as president based on his claim that he is not a communist anymore. He won with only about 38% of the vote, benefiting from a change in rules that no longer requires at least 45% of the vote to win. The poverty in many countries in Latin America may help explain why communism is more popular there. In Nicaragua, one of the poorest nations in Latin America, 46% of the population lived on less than $386 in income for the entire year of 2001. Not only is a job hard to find, but electricity and drinking water are not always available either. Poverty alone cannot explain the popularity of communism. In oil-rich Venezuela, the people reelected the communist Hugo Chavez in December 2006, and he spread communism to other nations there. Young and intimidating, Chavez was described as 'Castro with money.' In April 2009, he and President Barack Obama shook hands with enthusiasm for the cameras. But Chavez's insistence on communism was his downfall, because he developed prostate cancer and the inadequate communist health care system was unable to save him (American health care probably could have). Chavez died in 2013 at the age of only 59. The Cold War did not explain every conflict in the 20th century. For example, the Cold War did not explain the conflicts in the Middle East (Southwest Asia), where Islam is the dominant force. The United States helped build oil wells in Iran, Iraq, Saudi Arabia, and other Arab countries, but the Shiite Muslims disapprove of the American presence. In 1952, Gamal Abdel Nasser overthrew King Farouk of Egypt. Nasser modernized Egypt’s economy and military, seeking to build a nation that could assert its power in the Middle East. In 1956, Nasser seized the Suez Canal from the French and British companies that controlled it. His plan was to nationalize the canal to raise money to build the Aswan Dam, and needed cash after the Americans and British withdrew a pledge to help fund it. Nasser’s seizure of the Suez Canal created the “Suez Crisis” for a week because many nations, including Israel, relied on the Canal for shipping. The British and French provided air support for an invasion by Israeli troops, which easily overcame Egyptian resistance. But then the Soviet Union threatened to intervene on behalf of Egypt, creating a risk of a world war. Nasser was allowed to keep the canal, and international pressure by the United States caused Britain, France and Israel to back off. In Iran, the United States supported the pro-West Shah Mohammed Reza Pahlavi (“Shah of Iran”) against a revolt in 1953. For 25 years the Shiite Muslim leaders in Iran, also known as “ayatollahs”, opposed the Shah. In 1978, the Shiites revolted and caused the Shah to flee, and in 1979 he sought admission to the United States for medical treatment. The Ayatollah Ruholla Khomeini took control of Iran. Henry Kissinger, whose friends and business clients probably included supporters of the Shah, persuaded President Jimmy Carter to admit the Shah to the United States to treat his illness. Carter granted the Shah admission, and student Shiites in Iran angrily responded by taking 69 Americans hostage at the U.S. embassy in Tehran. They demanded that the Shah be returned to Iran, but Carter refused. The Shiites did not release their 55 American hostages until Carter was replaced by Ronald Reagan as president on Jan. 20, 1981. In 1980, the Sunni Iraq leader Saddam Hussein sought to conquer neighboring Iran. Iraq and Iran fought a fierce battle for nearly a decade without a victory by either side. In 1979, Muslims in Afghanistan (in Southwest Asia) revolted against the Soviet-friendly communist government there. The Soviets responded by invading Afghanistan and attempting to suppress the revolution. The United States reacted to this Soviet invasion by boycotting the summer Olympic Games in Moscow and providing arms to the Afghan rebels. The Soviets struggled for a decade in Afghanistan, much as the United States had struggled in Vietnam, and the Soviets eventually withdrew from the country. In many ways, Islam is a more powerful ideology than communism, and in this case Islam did defeat communism in Afghanistan. But some communists claim to be Christians, there are also some communist (or socialist) Muslims. Stalin died in 1953, and Nikita Khrushchev replaced him as the dictator over the Soviet Union. Khrushchev was an aggressive leader who had brutally carried out Stalin’s policies while Stalin was alive, but then denounced Stalin as soon as he died and tried to purge all memory of Stalin (“de-Stalinization”). However, Khrushchev was nearly as evil as Stalin was. Khrushchev viciously repressed a freedom movement in Hungary in October 1956. He ordered an invasion with Soviet tanks and arranged for the execution of the Hungarian leader Imre Nagy, who sought to hold free elections. Khrushchev replaced him with a pro-Soviet puppet (a "puppet" in politics is someone who is controlled in his political decisions by someone else). Thousands of Hungarian “freedom fighters” were slaughtered by the Soviets, and the Hungarian religious leader Joseph Cardinal Mindszenty (a high-ranking clergyman in the Catholic Church) fled to the United States embassy to survive. (A country's embassy is considered part of that country, and even though it is located in another nation the authorities in the other nation are not allowed to go inside without permission.) The communist dictatorship installed by the Soviets prevented him from stepping foot outside of the embassy building for the next 15 years. Imagine never once leaving your home for 15 years! Khrushchev also ordered the building of the Berlin Wall and the placement of missiles in Cuba, which led to the Cuban Missile Crisis. But Khrushchev’s confrontational personality was too much even for his fellow communists, as he would often interrupt speeches by others and act in other unpredictable ways. Khrushchev could not get along with China, even though both were communist countries. In 1960, Khrushchev stopped sharing atomic bomb secrets with China, and later there was even a little violence along their long border. While Khrushchev was on vacation in 1964 a group led by Leonid Brezhnev arranged to strip him of power. The group persuaded the Politburo, which governed the Communist Party, to replace Khrushchev with Brezhnev. Khrushchev then lived out the remainder of life under the watch of the Soviet KGB, but he did manage to smuggle out his memoirs for publication in the West. Brezhnev ruled as brutally as Khrushchev had, though with less personal confrontation. When Czechoslovakian leader Alexander Dubcek allowed greater freedom of speech in his country in 1968, the Soviets responded by invading with tanks just as they had in Hungary over a decade earlier. President Nixon sought to take advantage of the icy relationship between the Soviet Union and China, and also to open up China to American businessmen. Chinese Premier Zhou Enlai began to end China’s isolation from the rest of the world by inviting a U.S. table tennis team to tour China in 1971. President Nixon then stunned the world and his conservative supporters, who opposed communism, by supporting membership in the United Nations for Communist China (the “People’s Republic of China”). In 1972, President Nixon became the first American president to travel to Communist China. By 1979, there were diplomatic relations between the United States and China. Also in 1972, Nixon traveled to the Soviet Union and signed an arms agreement with the Soviet Union to reduce the numbers of nuclear weapons. This agreement was “SALT I,” representing the “Strategic Arms Limitation Treaty.” These apparently friendly dealings between the archenemies United States and the Soviet Union were described with the French word of “détente” (relaxation in tension between nations). For centuries French was the language of diplomacy in Europe and its vocabulary offered the best terms. SALT I limited the United States and Soviet Union to their 1972 levels of intercontinental ballistic missiles. In 1975, the two nations signed another arms reduction agreement known as the Helsinki Accords, and this was joined by 35 other nations. The American presidency had changed from Nixon to Gerald Ford by 1975, but in practice the Administration was still being run by Henry Kissinger and his view of world government and relations. Conservatives criticized both treaties as hurting the United States, emphasizing that there was no way to enforce the treaty against the Soviet Union. President Jimmy Carter continued the trend by signing SALT II in 1979, which would have provided for further reductions. In a victory for conservatives, the U.S. Senate refused to ratify that treaty. At one point, President Carter told the American people that his 12-year-old daughter was upset about the growing problem of “nuclear proliferation,” by which many other nations such as India and Pakistan acquired atomic bombs. Many thought Carter's reasoning was silly. In November 1980, the first modern conservative was elected president of the United States: Ronald Reagan. President Reagan cut taxes, defeated communism, and promoted the most original and influential idea of any president in all of American history: the Strategic Defense Initiative (SDI), or “Star Wars.” This was a plan to use advantaged technology to intercept and destroy, in mid-air, fast-moving missiles that might be launched against the United States. Reagan’s critics ridiculed SDI as impossible and dangerous. But those criticisms were somewhat contradictory with each other; it was precisely because SDI might be possible that it was so beneficial. The Soviet Union, then led by Mikhail Gorbachev, panicked. Gorbachev met with Reagan at a summit in Reykjavik, Iceland in 1986 in which Gorbachev promised almost anything if Reagan would agree to drop SDI. The media pressure was intense for Reagan to agree. But Reagan stood up for America. He shook his head and he said “no deal.” The next year Reagan made a trip to the Berlin Wall, against the recommendation of his advisers, and declared to the world, “Mr. Gorbachev, tear down this wall!” Remarkably, two years later the Germans did exactly that, and tore down the Berlin Wall built by the communists. Although Reagan and Gorbachev did sign the Intermediate-Range Nuclear Forces (INF) Treaty in 1987, which banned missiles with ranges of 300 to 3,400 miles, the historic decision was Reagan’s refusal to sign a treaty at Reykjavik giving up SDI. Communism in Eastern Europe and the Soviet Union was thereby vanquished within a few years. For most of the population in the world, the history of the 20th century can be summed up in one word: Independence. That is true for India (about 1 billion people), Indonesia (215 million), much of Africa (890 million), Israel, and Eastern Europe. Additional nations, China (1 billion) and Latin America (523 million), had already acquired independence prior to the 20th century, but had important nationalistic movements during the 20th century too. Both Hindus and Muslims sought independence in South Asia, which now consists of India and the surrounding countries of Pakistan, Bangladesh, Nepal, Bhutan, Myanmar and Afghanistan. Many of those countries did not exist at the time of World War II. 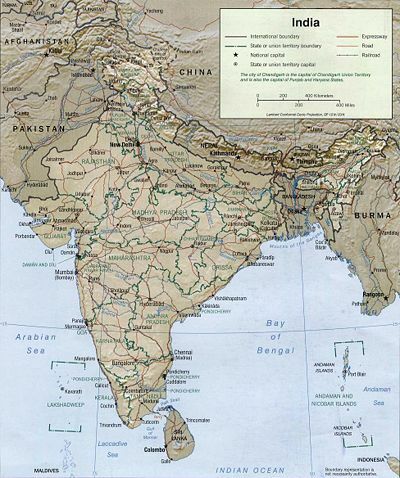 The “Indian subcontinent” today consists primarily of India, Pakistan, and Bangladesh. The Hindu group pushing for independence was the Congress Party, while the Muslim League was the pro-independence Islamic group led by Muhammad Ali Jinnah. In 1946 the Great Calcutta Killing occurred, which was a riot between Hindus and Muslims resulting in 6,000 deaths. On both sides of India, East and West, were regions dominated by Islam. In 1947, they achieved independence as East and West Pakistan based on a partition by the British House of Commons (East Pakistan later became Bangladesh). Religious conflict continued. Gandhi went to Delhi in January 1948 to urge fair treatment for Muslims, and was then assassinated by a Hindu. India received its independence from Great Britain on August 15, 1947, and instantly became the world’s most populous democracy. Jawaharial Nehru was its first prime minister. He began the long process of modernization and sought to de-emphasize the caste system. Two years later, in 1949, a war broke out between India and Pakistan over Kashmir, and this dispute continues today - even though China seized part of Kashmir in 1962. Both India and Pakistan joined the British Commonwealth as Dominion members and adopted English as their official languages. India sought assistance from the Soviet Union, while Pakistan aligned with the United States. Nehru ruled India for nearly two decades, and, subsequent to his death, his daughter Indira Gandhi became prime minister in 1966 (despite her name, she was not related to the famous Gandhi). Her rule saw an increase in agricultural production known as the “green revolution,” but she attempted to limit population growth with strict birth control. She also suspended parts of the democratic process. The people responded by defeating her in 1977, and she left office. In 1980, she regained power, but violence was breaking out with Sikhs who wanted an independent state. She ordered an attack on a Sikh temple, and two of her bodyguards retaliated by assassinating her in June 1984. Rajiv Gandhi succeeded his mother as the leader of India. He lost power in 1989 based on accusations of corruption. A group of Tamil terrorists from Sri Lanka killed him with a bomb in 1991. Sri Lanka is the pear-shaped island off of the southern coast of India, which obtained its independence in 1948. Sri Lanka has a Buddhist majority, and the Tamils are a Hindu minority there who have been fighting for their own independence. Rajiv Gandhi had sent troops into Sri Lanka under a 1983 agreement to disarm the rebellious Hindus, which was unsuccessful. Shifting over to the history of the eastern portion of Pakistan, Indian-backed forces overthrew the government of East Pakistan in 1971 and established the new country of Bangladesh. The eastern and western parts of Pakistan had different ethnicities and languages and were separated by over a thousand miles, unable to remain united despite both parts being Muslim. West Pakistan then became Pakistan. In 1999, General Pervez Musharraf seized power by overthrowing Prime Minister Nawaz Sharif. Before him, Benazir Bhutto was a remarkable woman prime minister for this Muslim country. Bhutto was a strong, outspoken pro-life leader. Today Pakistan is one of the few Islamic nations possessing the atomic bomb, which it developed in the 21st century, much to the consternation of the rest of the world. When India and Pakistan sought and obtained independence from the British, other British and Dutch colonies in Asia attained similar independence. In Southeast Asia, Burma gained independence in 1948, and chose not to be a member of the British Commonwealth. It then suffered from some internal conflicts between communists and military dictators. In 1989, Burma renamed itself Myanmar. Ethnic conflict hurt British efforts to create a single nation of Malaysia after World War II. Large groups of Chinese and Malay peoples fought each other in Southeast Asia. In 1957, a Federation of Malaya brought together Singapore, Malaya, Sarawak, and Sabah. But in 1965, Singapore left the federation to become a separate nation composed of only one successful city. Today Singapore is one of the few city-states in the world, and is very prosperous. After Singapore split off, the other three regions (Malaya, Sarawak and Sabah) formed the Federation of Malaysia. Indonesia had been a Dutch colony until the Japanese conquered it early in World War II. After the war, Sukarno led a successful rebellion against the Dutch and established the independence of Indonesia in 1949. But Sukarno was unable to establish a democracy, perhaps because Indonesia has the largest Muslim population in the world. In 1965 there was a coup (rebellion) attempt in Indonesia, and General Suharto brutally suppressed it, killing perhaps a million people including many communists. In this striking battle between Islam and communism, Islam won. In 1967, Suharto appointed himself president and created a police state. He persecuted the Chinese and Christians, and in 1976 he seized East Timor and annexed it to Indonesia. In addition to the British and Dutch, the United States also granted independence to its Asian colony: the Philippines (on July 4, 1946). The United States kept military bases on the Philippines under 99-year leases, but later gave up those leases under criticism of being imperialistic. The U.S. left her bases there in 1991. The Philippines has a history of communist insurgency, and President Ferdinand Marcos suppressed the communists during his rule from 1966 to 1986. For ten years during that period he even imposed martial law. But when Benigno Aquino, a political opponent of Marcos, was immediately assassinated upon his return to the country from the United States, American newspapers blamed Marcos for the killing and demanded his resignation. He would not resign; however, Aquino’s widow Corazon Aquino defeated Marcos in the election of 1986. Time magazine named her 'Woman of the Year,' and Marcos fled to Hawaii, where he eventually died. Five European powers – Great Britain, Belgium, France, Portugal, and the Netherlands – had divided Africa into colonies during the Imperialism Era. Their divisions showed no regard for ethnic groups and local culture. Europeans created huge farms that could be more profitable for the mother country, such as cash-crop plantations. When it came time for the Europeans to leave, the African economy lacked self-sufficiency. There was a middle class in Africa. Many Africans were educated in the Western world, and they led a pro-African or pan-African movement called “Negritude”. This built pride in African culture and accomplishments. Great Britain had three large African colonies: Nigeria, Kenya and Ghana. Nigeria was most populous colony in Africa and one of the most prosperous, and it won its independence in 1960. But its ethnic diversity led to civil war between the Muslim Hausa-Fulani and the Christian Igbo and Yoruba. There was tension even within the Christian groups, as Igbo preferred a democratic society while the Yoruba preferred a monarchy. Oil was discovered in Nigeria and it joined OPEC. But the Muslim Hausa-Fulani seized power in 1983 and ruled for 16 years, discriminating against the Christians. In 1999, a civilian government was reestablished pursuant to a new constitution. A Kenyan nationalist Jomo Kenyatta, who had been educated in Britain, joined a secret organization known as Mau Mau. Its purpose was to drive the British out and establish independence in 1963. The United States, fearing infiltration by communists, sided with Britain in opposing this. Kenyatta established Nairobi as a business center in East Africa. Daniel arap Moi succeeded Kenyatta upon his death in 1978. Ethnic strife and protests for greater democracy plagued Kenya at the end of the 20th century. The British Colony of the Gold Coast (Ghana) was the first of all these to achieve independence. Kwame Nkrumah was helped by the communists and by his education in the United States. He spent money on improving roads and education and health care, but the economy failed as a result. He was also a leader establishing the Pan-African Congress in 1945 with the help of Jamaican-born Marcus Garvey. The goal of this organization, along with the Organization of African Unity (OAU) (founded in 1963), was to establish an Africa ruled by Africans. But in 1966, the Ghana military revolted against Nkrumah while he was away in China, presumably on a mission to obtain more communist aid. Power has frequently changed hands in Ghana ever since, and at two points (1979 and 1981) a Ghana Air Force pilot named Jerry Rawlings served as president. France had many small colonies in Africa, including Morocco and Tunisia, to which France granted independence in 1956. But France’s primary colony was Algeria, a Muslim country in North Africa. Instead of granting it independence, France offered citizenship to all the Algerians, which explains why the Muslim population in France is larger than in other European countries today. The Algerians wanted independence despite the presence of thousands of French citizens in Algeria. In 1945, there was a bloody demonstration for independence, and in 1954 the Algerian National Liberation Front (FLN) demanded full independence. The French responded by sending troops to suppress the FLN. In 1958, Charles de Gaulle successfully returned to power in France, after having led France during World War II. He feared an Algerian rebellion, and favored granting independence to it and others. France officially granted Algeria independence in 1962, and Ahmed Ben Bella became its first prime minister. In 1965, Ben Bella was deposed (overthrown). A fully Islamic government took control in 1985 due in part to a drop in the price of oil, which caused a crisis in the Algerian economy. Belgium held the Congo as an African colony for mining copper and producing rubber. When Belgium granted Congo its independence in 1960 and Patrice Lumumba was sworn in its its first prime minister, the young nation was unprepared. Moise Tshombe, a leader of southeast region that had the copper mines, announced its separate independence. Tshombe was backed by Belgians interested in the copper, while Lumumba was supported by the communist Soviet Union. Joseph Mobutu, with sympathy from the West, then overthrew Lumumba, who was then murdered. Tshombe ruled for a short period until he, too, was overthrown by Mobutu. Mobutu renamed the nation Zaire, and ruled it for 32 years. He personally accumulated enormous wealth from the nation, until he was deposed (overthrown) by Laurent Kabila in 1997. Kabila then changed the nation's name to the Democratic Republic of Congo. The neighboring countries of Rwanda and Uganda supported an insurrection in 1998, and a civil war resulted between the pro-Kabila Hutu tribe and the anti-Kabila Tutsi tribe. As more African nations became involved in this conflict in Central Africa, it began to look like the first all-African war. The United Nations sent peacekeeping troops in February 2000 and a cease-fire was declared later that year. Portugal suppressed independence movements in its colony of Angola until 1975, when opposition to the continuing expenses caused an overthrow of the government in the mother country of Portugal itself. Once free, three different revolutionary groups fought each other for control of Angola: (1) the communist Popular Movement for the Liberation of Angola (MPLA), which grabbed the Angolan capital city of Luanda, (2) the National Front for the Liberation of Angola (FNLA), which was supported by Zaire and the United States, and (3) the National Union for the Total Independence of Angola (UNITA) which was aided by South Africa and the United States. Peace was not achieved until 1988 and only then did the communist Cuban troops leave. All three groups continue to seek representation in the Angolan government. South Africa was the most complex, and the most prosperous, of all African colonies. As early as the 1600s, the Dutch established Cape Town as a city at the southern tip of Africa. But during the Napoleonic Wars the British captured Cape Town (in 1815) and drove the Dutch (the “Boers”) inland. The Dutch favored continuation of slavery; the British abolished slavery in its empire in 1833. The Boers fought the native Africans (Bantu tribes such as the Zulus) during the Great Trek of the Boers. The Boers founded two inland republics, the Transvaal and the Orange Free State. But the British were more powerful, and controlled wealthy diamond mines. The Brit Cecil Rhodes acquired great wealth through his monopoly of the diamond production in 1889, and he served as prime minister of the British Cape Colony from 1890 to 1896. A Boer War ensued from 1899 to 1902, and afterward it was the Boers (the Dutch) who established “apartheid”. Apartheid segregated the majority blacks from the minority whites in South Africa, with the white minority controlling the country. The British granted South Africa independence in 1910, and it became a member of the British Commonwealth in 1931 with its constitution allowing white rule over the blacks. But the country was prosperous, and all enjoyed a higher standard of living than the remainder of Africa. The Dutch South Africans (Afrikaner) gained control in 1948 when their National Party rose to power and enforced apartheid throughout South Africa. Homelands (segregated areas) were even established for the rival African tribes, and the whites reserved the best property for themselves. Ever since 1912 the all-black African National Congress (ANC) objected, but it was suppressed. Demonstrations, such as the 1960 Sharpeville Massacre, occasionally broke out but were violently put down. An ANC leader named Nelson Mandela was imprisoned for his role in that demonstration. Riots over school segregation occurred in Soweto in 1976, and in 1977 the government beat an outspoken critic, Steve Biko, to death. There was increasing pressure worldwide for South Africa to end its racism. Its athletes were banned from the Olympics since the 1960s, and trade restrictions were imposed by other nations. A black South African bishop, Desmond Tutu, called for boycotts of his own nation. In 1989, a new South African president named F.W. de Klerk was elected, and he ended apartheid in 1993. With international approval, de Klerk legalized the ANC, released Nelson Mandela from jail, obtained repeal of apartheid laws, and agreed to fully democratic elections in 1994. Nelson Mandela then won those elections and the ANC won a majority in the National Assembly, the bigger house in the South African Parliament. A new constitution containing a bill of rights like that in the United States was adopted in 1996, but also included entitlements. In the same year, liberals passed a pro-abortion law and the number of abortions there has tragically increased 100 times between 1990 and today. The world fully accepts South Africa now, and it hosted the World Cup (soccer) in 2010. But while the outside world accepts South Africa, the country has been hurt by a mass exodus due to increased crime. "We as a nation cannot afford to lose skilled and hard-working citizens of whatever hue," declared one South African candidate for high office in 2006. Somalia is a Muslim country that is a combination of former colonies known as British Somaliland, French Somaliland and Italian Somaliland. Somalia has been Muslim since A.D. 900 and today is considered one of the bases for the terrorist group al-Qaida. Roughly the size of New Jersey in area and population, Somalia is located on the coast of East Africa (the Indian Ocean) and borders both Ethiopia and Kenya. Somalia obtained its independence in 1960. The violence is so bad in Somalia today that it has no central government at all. In 1993, 18 American soldiers were killed in Somalia, and on Jan. 9, 2007 the United States bombed parts of the country where al-Qaida terrorists were believed to be hiding. “Zionism” began in the late 1800s to reestablish a Jewish state in Palestine in and around Jerusalem, which the ancient Hebrews had built. Theodor Herzl led the movement in the 1890s to establish a modern state of Israel. Jewish people were motivated partly by the religious faith that Jerusalem and Palestine were the Promised Land, and partly motivated by a desire to live together again after many centuries of dispersion in other lands, where they endured persecution. The Russian pogroms of violence against Jewish settlements reinforced the desire for a new Jewish homeland. The “Dreyfus Affair” in France in 1894, whereby a French captain was persecuted based on a false accusation of selling military secrets to Germany, added to the desire for a Jewish nation that could defend against persecution. The Turks controlled Palestine for centuries leading up to World War I, but the defeat of the Ottoman Turks in that war allowed Great Britain to assume control of the territory. Its Balfour Declaration (1917) favored a Jewish homeland while protecting rights of Arabs living there. Between the world wars many Jewish settlers from Europe migrated to Palestine and set up communal agricultural settlements known as kibbutzim, in anticipation of a new Jewish state. The Jewish population in Palestine increased from about 84,000 in 1922 to 554,000 in 1945, but the Muslim population also increased by almost an identical amount from 589,000 to about 1,036,000. Today there are about 5 million people of Jewish origin living in Israel. Relatively few Jewish citizens of the United States have moved to Palestine, but they have generously lent financial and political support for the Zionist cause. The Balfour Declaration called for the creation of Palestinian state in addition to Israel. Lawrence of Arabia (a British leader, T.E. Lawrence, who inspired an Arab revolt against the Ottoman Turks during World War I) then helped create Jordan (originally Transjordan) as a semi-autonomous Palestinian state in 1921. Jordan attained its full independence in 1946. But later there were demands for another Palestinian state. Lawrence of Arabia favored promotion of the British Empire in the Middle East, and resisted creation of a Jewish state as a threat to British influence in the region. Others opposed the creation of a Jewish state by arguing that it would be imperialistic, and migrating Russian Jews were accused of imperialism. World War II changed many things, and after the war Great Britain asked the United Nations to partition Palestine. The United Nations carved out a small parcel of property, slightly smaller than the state of New Jersey, for a new Jewish state to be named “Israel” (see map). This new nation was born on May 14, 1948, with David Ben-Gurion as its first prime minister and renowned scientist Chaim Weizmann as its first president. The Muslim Arabs refused to accept the existence of Israel. The surrounding Arab states invaded Israel the next day, and started additional wars in 1956, 1967 and 1973. The conflicts prevented the United Nations plan for a separate Palestinian state from happening. The 1967 “Six-Day War” resulted when the Egyptian ruler Gamal Abdel Nasser closed off the Gulf of Aqaba, which was the only access Israel had to the Red Sea. Israel responded with massive air strikes against several Arab nations, including Egypt, killing many Arabs and destroying their militaries. Israel conquered Jerusalem, the West Bank, the Sinai Peninsula and Golan Heights. Palestinians in Jerusalem were offered the opportunity to become Israeli citizens, but many declined, leaving them without a country. Anwar Sadat succeeded Nasser as ruler of Egypt, and in October 1973, Sadat launched a surprise attack on Israel on its holy day, Yom Kippur. After suffering massive initial losses, the Israeli prime minister, Golda Meir, regained much of the lost territory. Golda Meir was the third women in history to run a nation, and David Ben-Gurion once described her as “the only man in the Cabinet” of Israel. However, she was forced to resign the following year based on criticism of how she handled the war. Winston Churchill also lost power as soon as World War II was over. Maybe voters simply wanted to replace someone who reminded them of the bad memories of war. In 1979 President Jimmy Carter brokered a peace agreement between Egypt and Israel, then led by Menachem Begin, and this deal is known as the Camp David Accords. Egypt agreed to recognize Israel in exchange for receiving return of the Sinai Peninsula. The United States promised both countries a massive amount of foreign aid, about $10 billion each year in gifts to each nation, to complete the deal. Though Sadat was assassinated by Muslims in 1981, his successor (Hosni Mubarak) promised to continue to honor the deal. Mubarak was overthrown in 2011. Yasir Arafat, a former construction engineer, founded the Palestine Liberation Organization (PLO) in 1964. It demanded a Palestinian state in the area of Jerusalem and rejected the right of Israel to exist. During the 1972 Olympics in Munich, Germany, PLO terrorists kidnapped and murdered Israeli athletes. In 1987, the PLO instituted a campaign of persistent violence called “intifada”, where common citizens and even children threw stones at Israelis and committed additional violence. Arab nations boycotted Israeli goods and even attempted to boycott any company that did business with Israel. Secret talks between Israeli leaders and the PLO in Oslo, Norway culminated with the Declaration of Principles in 1993, whereby Israeli Prime Minister Yitzhak Rabin agreed to allow Palestinian self-rule over two strips of land known as the Gaza Strip and West Bank, and Arafat and Rabin signed the agreement in front of President Clinton at the White House in 1993. This angered orthodox Jewish Israelis who had been building settlements in both regions, and one assassinated Rabin in 1995. A more conservative leader emerged in Israel named Benjamin Netanyahu, who negotiated a partial withdrawal by Israeli settlers from Hebron, which is on the West Bank, in 1997. In 2005, Israel removed its settlements from the Gaza Strip, and there is a quasi-Palestinian state called the Palestinian National Authority that functions under Arafat’s successor, Mahmoud Abbas. In the early 21st century, Israel endured a series of horrific suicide bombings, often targeting Jewish weddings, buses, caregivers and even children. Weekly and sometimes daily there would be new reports of a half-dozen Jews murdered by a Muslim suicide bomber, and sometimes a second bomb would detonate to murder those who came to the aid of the initial victims. Israel finally stopped the bombings by building a wall to end the flow of weapons and terrorists from hostile neighbors. Russia and other nations in the Soviet Union regained their independence when the Soviet Union broke up in 1991. One Russian then predicted that the United States will eventually break up in a similar way. Mikhail Gorbachev rose to power in the Soviet Union and in 1985 he promoted a new policy called “glasnost” or openness. This ended decades of censorship by the communist dictators, and free speech began to work wonders. Books could be published and churches could preach the Gospel. He released some political prisoners. Faced with a failing economy, Gorbachev adopted “perestroika”, which was a restructuring of the Soviet economy. He permitted some ownership of private property, such as small businesses, farms and factories. In 1987, Gorbachev introduced democratization that allowed fairer, more competitive elections. Gorbachev remained a dedicated communist, but he wanted voters to be able to choose between rival candidates rather than simply electing those candidates presented only by the Communist Party. He also encouraged Eastern European countries adopt reforms. As explained in more detail below, Eastern Europe took advantage of Gorbachev’s reforms to the point where they broke away from strict communism. This led Lithuania, which had been annexed to the Soviet Union in 1940, to declare its independence in March 1990. Gorbachev responded as his communist predecessors would have: he blockaded the rebellious country and, when that did not work, in January 1991 he ordered the Soviet troops to attack the capital of Lithuania. Civilians were slaughtered. But perhaps Providence intervened this time. Boris Yeltsin, a charismatic Russian, emerged to challenge Gorbachev’s leadership. Yeltsin had been a popular mayor of Moscow and was a powerful member of the parliament. In June 1991, the voters elected Yeltsin as president of a new Russian Republic. Communists were angry and determined to stop Yeltsin’s challenge. In August 1991, they ordered the soldiers to kill Yeltsin. Miraculously, the troops refused the order. Rarely do troops refuse orders. In a communist country, such refusal was unheard of. Gorbachev promptly resigned as head of the Communist Party, and then Latvia, Estonia and other Soviet republics declared their independence as Lithuania had. On Christmas Day of 1991, Gorbachev resigned as president of the Soviet Union. By then, Russia and the other newly independent republics had formed a federation to replace the Soviet Union, known as the Commonwealth of Independent States (CIS). All joined except for the Baltic republics and Georgia, a large former Soviet state not to be confused with the American state of Georgia. After Gorbachev resigned, Yeltsin brought free enterprise to Russia. He ended price controls, cut taxes, stopped subsidizing government-controlled industries and reduced trade barriers. Churches opened and flourished. The people of Leningrad changed the name of their city back to Saint Petersburg. Critics of Yeltsin complained about inflation and the loss of jobs, and organized crime became a problem without the KGB controlling everything. But the Russian people were not going back to communism. Today Russia has lower taxes than the United States, and Russia has passed pro-life laws. Christianity is growing there. Muslim-dominated Chechnya in southwest Russia became a difficult issue for Yeltsin. In 1991, it declared its independence from Russia, but Yeltsin suppressed that by sending troops to Grozny, its capital city. Resistance by the Chechens was intense, and the troops were initially withdrawn. But a bloody civil war has ensued for over a decade, including hostage-takings and, in 2004, the Chechen rebels seized a large school near Chechnya and killed over 300 of the children and teachers. The fall of communism in the Soviet Union really began in the Eastern European “satellite” countries of communism, initially in Poland and Hungary. In 1978, the Roman Catholic Church elected the first non-Italian pope in many centuries, elevating a Polish cardinal who had been active in the anticommunist movement in his homeland of Poland. Pope John Paul II then became a leader and hero to his countrymen in Poland, which is nearly 100% Catholic. Another Polish leader, Lech Walesa, led a strike against a shipyard in Gdansk in 1980, demanding government recognition for his labor union called Solidarity. The Polish communist government was weak at this time and vacillated in its response, but in 1981 it cracked down on Solidarity and imposed marital law throughout the country. A popular anticommunist priest was then murdered. An assassination attempt on Pope John Paul II, also thought to have been organized by communists, injured but did not kill him. As conflict worsened in Poland, Pope John Paul II visited the country and attracted literally millions of supporters. At one point, he stood at the podium with the communist-installed leader and lectured him about respecting the dignity and freedom of the Polish people. The communist leader trembled in front of the huge crowd. When the Soviet Union threatened to crack down on the Polish people, the Pope declared that he would respond by returning to Poland to fight on the front lines against the communists. In April 1989, the Polish government allowed free elections for the first time since World War II, and the people elected Lech Walesa as president and his group Solidarity swept into office. Communism was defeated. The fall of communism in Poland had this great effect: the new Christian-based government banned abortion, and it has decreased to nearly zero there. Abortion rates in the communist Soviet Union had been several times higher than the rest of the world. Hungary, the same country that attempted to overthrow communism in 1956, immediately followed Poland’s lead. In October 1989, opponents of the Communist Party took it over and dissolved it. A new constitution allowed for national elections in 1990, and the people defeated the communists in power. Hungary embraced some free enterprise and started a stock market. But like much of Eastern Europe, socialists remained powerful and in 1994 they crept back into power and raised taxes. Today Hungary is a mixture of socialism and free enterprise. Hungary helped end communism in East Germany, which was the most brutal of the communist regimes. Hungary opened its border to allow East Germans to emigrate into Austria, from where they could escape entirely. As East Germans began to leave in droves, the communist leader Erich Honecker closed the border. But demonstrations broke out in October 1989, which not even the ruthless Honecker could control. He resigned and his successor, Egon Krenz, reacted by opening the Berlin Wall on November 9, 1989. East Germans then poured into West Berlin and tore down the wall entirely. By the end of the year communism was defeated in East Germany, and within a year it was reunited with West Germany to form one nation of Germany under West German Chancellor Helmut Kohl. Germans expect that it will take an entire generation (30-40 years) to bring the formerly communist section up to the prosperity of the free West Germany. Other Eastern European countries then wanted the same freedom from communism. In Czechoslovakia, demonstrations forced the Communist Party leader Milos Jakes to resign in November 1989, and he was replaced by Vaclav Havel. In 1993, the country split along ethnic lines to form Slovakia and the Czech Republic, caused in part by economic difficulties in the conversion from communism to free enterprise. Next came Romania, which had been ruled for decades by the communist dictator Nicolae Ceausescu. Massive demonstrations against his rule in December 1989 caused the army to join the people, and they captured Ceausescu as he attempted to flee with his wife. They were executed on Christmas Day; the timing suggests that the revolutionaries were not good people themselves. But at least free elections began in 1990. Ceausescu opposed abortion, unlike most communists. Ceausescu’s ban on abortion there had helped avoid many of the health problems caused by abortion. Romanians had the lowest incidence of women’s breast cancer in the Western world, far lower than the United States. In 1990, American families rushed to Romania to adopt babies who were available for adoption there. But after Ceausescu was overthrown and abortion was legalized, Romania began promoting abortion. The abortion-related health problem of breast cancer then skyrocketed. The collapse of the communist dictatorship exposed underlying ethnic and religious conflict, particularly in Yugoslavia. Its dictator, Marshall Tito (real name Josip Broz), ruled with an iron fist from 1945 to 1980, preventing the different ethnic groups from fighting each other because he suppressed all conflict. He also insisted on some independence from the Soviet Union, and Stalin expelled him from the Soviet bloc in 1948. Tito was succeeded in power by the Serb Slobodan Milosevic, which caused Slovenia and Croatia to seek independence due to their different ethnicity. In June 1991, the Yugoslavian army attempted to suppress these independence movements. Bloodshed continued in Croatia as the Serbs battled the Croats. Eventually, the United States and North Atlantic Treaty Organization (NATO) intervened in 1999 in what is known as the Kosovo War or Kosovo Conflict, driving Milosevic from power and forcing his trial by an international tribunal. He died of natural causes during a lengthy "war crimes" trial. Ethnic conflict was even worse in Bosnia-Herzegovina, which consists of Muslims, Croats and Serbs, who are Christian. Bosnia-Herzegovina first declared its independence from Serbia, but the Christian Bosnian Serbs did not want to live under Muslim rule and a civil war began in March 1992 over whether Bosnia would split from Serbia. Anti-Christian press accused the Serbs of “ethnic cleansing,” or racially motivated mass murders, as the Serbs were allegedly killing off Bosnian Muslims. A peacekeeping army was sent by the United Nations. In December 1995, the Muslims, Croats and Serbs signed a peace treaty. In 1996 a three-person presidency including a leader from each group was elected. The conflict in Bosnia caused the United Nations (U.N.) to send troops, including American soldiers, into the region in 1995. Michael G. New was an American soldier who objected to wearing United Nations insignia as part of his military uniform during a deployment to the nearby Republic of Macedonia as part of the United Nations Preventive Deployment Force. Michael New objected to changing his allegiance from the United States to the U.N. When Michael New enlisted in the U.S. Army in February 1993, he took an oath to defend the U.S. Constitution, not the United Nations. But on May 3, 1994, President Bill Clinton signed Presidential Decision Directive 25 (PDD-25). This ordered submission of American troops to multilateral peace operations. In July, Michael New was assigned to Germany, 3rd Infantry Division, and his company was told it would be sent to Macedonia as part of a “peacekeeping” mission. In August 1995, Michael New was informed that his unit must wear part of the U.N. uniform. Soldier New’s position was that the order was unlawful and unconstitutional. Specifically, U.S. Constitution Article I, Section 9 prohibits any person’s acceptance of any emolument from a foreign state without congressional consent. New also argued that the entire deployment as part of a United Nations force was unlawful. But the military judge and courts rejected New’s arguments and held that the legality of the deployment was a "non-justiciable" political question which could only be handled by a political branch of government (such as Congress or the President). In 1978, Deng Xiaoping succeeded Mao and Zhou as dictator in China. He was more friendly to capitalism and the West, and began a program called the Four Modernizations. He abolished communes and began leasing land to farmers who could work the land for personal profit. He permitted private businesses and some foreign investment in special economic zones (SEZs). He promoted tourism and sent many Chinese teenagers to the West to be educated in Western colleges. But when Chinese students sought greater freedoms and democracy, Deng brutally suppressed them by sending tanks to Tiananmen Square to massacre hundreds of demonstrators on June 4, 1989. Jiang Zemin succeeded Deng when he died in 1997. He refused to improve China’s record on human rights, and Christianity and democracy remain suppressed there. Today China points many of its nuclear missiles at California. On July 1, 1997, Great Britain’s lease on Hong Kong expired and Britain returned it to China, which promised to keep Hong Kong capitalist for 50 more years. "Latin America" includes Spanish America and Brazil, where Portuguese is the primary language. In other words, Latin America is all of America south of the United States, other than the Caribbean islands. Latin America is thus Mexico, Central and South America. It has 523 million people, far more than the U.S. population of about 300 million. The nations of Latin America had won their political independence from European powers long before the 20th century. But they have struggled in becoming economically independent. It was not until the middle of the 20th century that Latin American nations began to export manufactured goods in addition to minerals and food. In the 1970s and 1980s, huge debts to foreign powers combined with a depression caused severe economic problems. Lending policies of developed nations and their organizations, such as the World Bank, led to this debt crisis. By 2000, after much loan forgiveness and an improved worldwide economy, Latin American nations had stronger economies and less dependence on foreign powers. In Mexico, the rule of President Lazaro Cardenas from 1934 to 1940 redistributed land from the wealthy to peasants. He also forced foreign investors to give up control over Mexican oil wells. The Institutional Revolutionary Party (PRI for its Spanish initials) controlled Mexico from 1929 to 2000, when Vicente Fox of PAN (Partido Accion Nacional) was elected president. The PRI was known for corruption and acting on behalf of wealthy Mexicans. In Argentina, the military has long controlled the government. The most popular military ruler was Colonel Juan Peron, who was elected in 1946. He became known for his “popular dictatorship.” His wife, Eva Peron, was even more popular for her tremendous charisma. Juan Peron ruled for over a decade, and brought industrialization and working class values to the nation. He limited foreign ownership. But critics felt Peron infringed too much on civil liberties. He was deposed in 1955 but came back briefly in the 1970s. In 1982, Argentina attempted to take the Falkland Islands, which are located off its shores in the Atlantic Ocean, away from the British, which fought back with the help of American intelligence and regained control of the islands. ↑ Today the term “developing world” is more “politically correct” than “Third World.” Traditionally, the “First World” was the industrialized, capitalist societies of Europe, Japan, and the United States, and the “Second World” was the less developed communist nations. This page was last modified on 15 June 2014, at 14:15. This page has been accessed 20,954 times.